Nothing makes me happier right now than getting something new for the house. Don’t get me wrong, I still love getting down and dirty on swatching and trying on new makeup but my home, it’s where my attention lies most of the time. I’d like to think I’m maturing now but who doesn’t want the best for their homes at any age right? My recent acquisition is a brand spanking new vacuum cleaner! From Electrolux no less who has 100 years of vacuum cleaner making history under their belt. I do loooove me some fresh smell of an unboxed appliance! You know what I’m talking about! 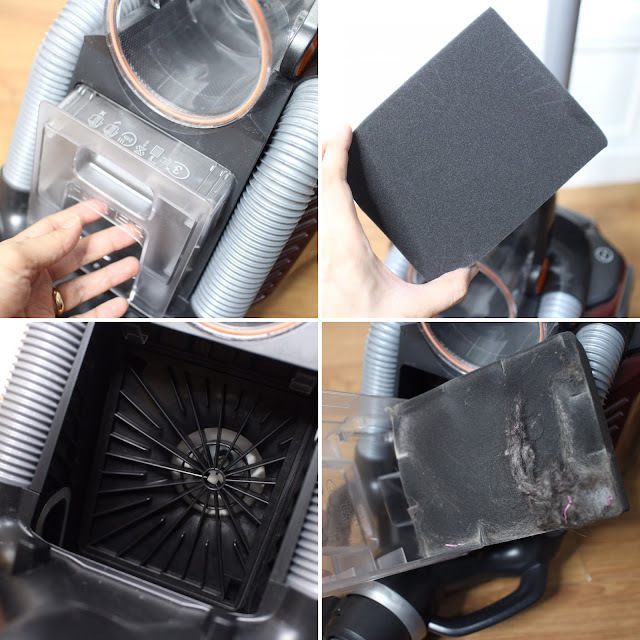 I was unwrapping the latest Electrolux UltraFlex Vacuum Cleaner at home with my daughter and I knew already that it will be just good as it is raved online. This latest vacuum cleaner is light, even my daughter can carry it. Assembly doesn’t take too long. It took about 5-10 minutes reading the manual and under 10 minutes, I was already vacuuming my home with its flex-roller head. What I didn’t realize though is that how mediocre my regular vacuum cleaner was. I didn’t realize how much I was compromising with my old unit. Allow me to share some of its features. With my new Electrolux UltraFlex, I was cleaning more than the surfaces of my home. 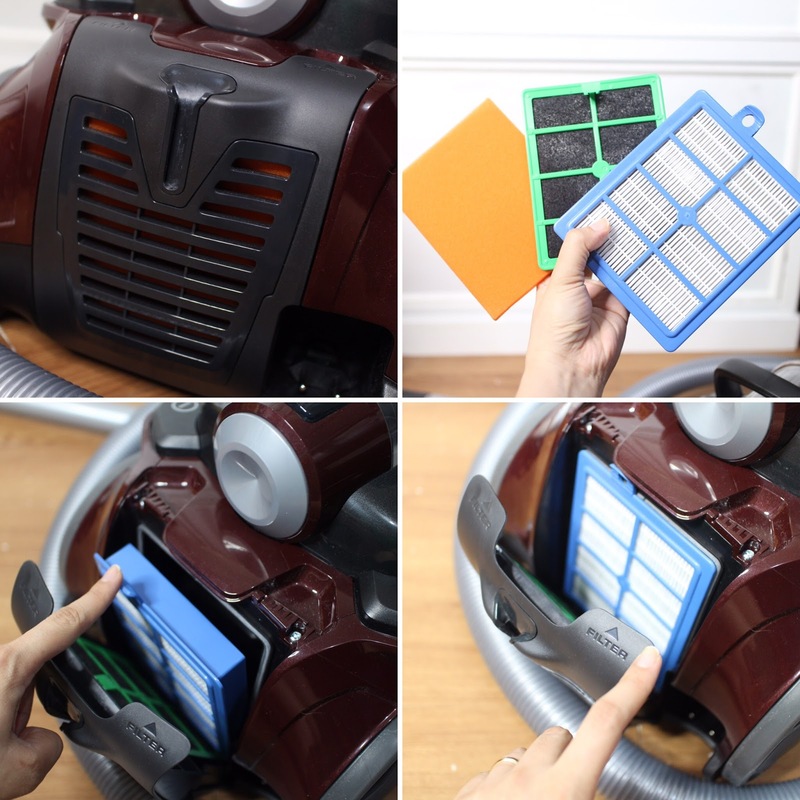 One of the things I was excited about were the HEPA13 Washable Exhaust Filter and Replaceable Carbon Layer, it seals up to 99.99% of dust and allergens! Cheers to asthma medication that I can save because of this vacuum. You know how vacuum lets out air at the back of their unit? Did you know what dust and allergens can get out from it and gets dispersed back into your home? If you have allergic rhinitis then you know what I’m talking about. No wonder I would always get a bout of asthma attack whenever I use it! With the HEPA13 Washable Exhaust Filter and Replaceable Carbon Layer, the air that UltraFlex lets out is actually cleaner! No asthma attacks and I didn’t mind having Claud in the room while cleaning. It was a good way to start teaching the kiddo chores, too. And she loves tinkering with the new UltraFlex! You know you have an extra special vacuum cleaner in your hands if the the nozzles require their own introduction. FlexPro Plus nozzle is the only nozzle in the market certified by SLG to achieve 5 stars in Edge Cleaning on Hard Floor. Exactly the floors I have at home! And given its name, it did get to almost all nook and crannies without an effort. Especially in my home that has something in every space. I was able to reach under the bed, the couch and sides of the fridge without moving any furniture at all! Bed Pro Nozzle is like a Mother’s Day gift to me! I hate feeling crumbs on my bedsheet. So much that I make sure to “pag-pag” the bed before I go to sleep! Naturally I was just putting the crumbs back on the floor. Now with the Bed Pro Nozzle, I get to vacuum these pesky uncomfortable crumbs off for good! I also got to clean my mattress and couch with this one. It’s so convenient to have this! Speaking of nozzle, how cool is it that the handle is ergonomically made with a slim remote control that lets you turn on and off your unit and control the speed. You can also lengthen the tube to reach ceilings. But what truly makes a fabulous vacuum cleaner is the machine inside of it. UltraFlex is a well-engineered machine that is able to vacuum anything off of any surface with its Turbo Cyclone and Twin Inlet Channels. The turbo cyclone can separate air and dust that you can see in the dust bin! No cloud of dust will come in the end of the unit! The Air spin of UltraFlex is so fast its speed is as high as 140km/h! While the inlets channels drives the airflow inside the Turbo Cyclone. The body is made for ease of use, the buttons are big, the LCD projects the intensity of the airflow and there’s 12 meter cord that automatically retracts (yes! it does!) that navigating around the room is no longer a feat. Personally, we moms pretty much don’t bother with the details because what we want needs to be proven! And boy was I able to prove it! UltraFlex really did a great job at keeping my floor smooth, even shiny with just few passes. No more spending on static tissues to sweep off the hairs and dust off my floor. No more mopping every other day! 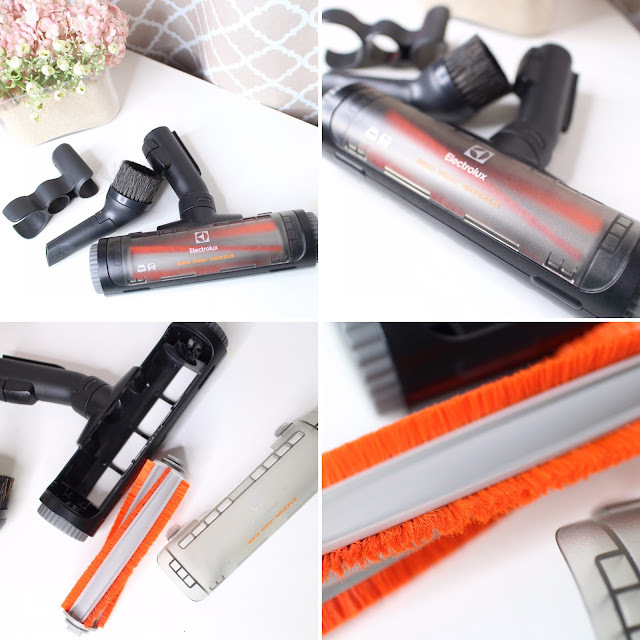 UltraFlex catches dust, hair and fur! The dust bin proved that sweeping is not enough with how full it is every time I use it. It makes me wonder if I have problem with hair fall. LOL! Best of all, no more back-breaking cleaning because this machine ultimately does it all. My yaya will never leave now because I took away the task of vacuuming the whole condo! And the clean up! Oh! What a joy it is! The filter, the dust bin, cyclone filters are all easily detachable! Even the bed pro nozzle brush is easy to clean. Run them through water, let it dry and snap them back into place. The manual has detailed instructions that’s easy to follow. But even if you’re the type to throw manuals (which I don’t recommend), you can still assemble it. Like with so many things, you just can’t sacrifice quality for the price. Yes, UltraFlex may be 3x as expensive as a regular vacuum cleaner but looking at it now, I feel ripped off with the one we got 3 years ago. Barely functioning, bag that needs replacing and cleaning with it always gives me allergies. Even the tubes and the pipes where of low quality. Bagless - no need to replace bags because the dust bin catches a liter of dirt. The dust bin has a quick release bottom that you don’t have to get in contact with the dirt at all. Bed Pro Nozzle - for the OC in all of us! I seriously have nothing bad to say about this because it is worth every penny. While doing my research most appliance review sites gave this unit high scores and being able to try it proved how much UltraFlex deserved it! I no longer can’t imagine not having a vacuum cleaner at home! I feel so extra special with it, the color alone is so chic and aptly named, too - Dark Bordeaux Electrolux UltraFlex Vacuum Cleaner. So if you’re wondering what to get your mom or your home this Mother’s Day, this is it!